In Harmony Server, you can choose to render your scene locally or to send it to the render farm on your network so that other computers can render your scenes while you continue working on your station. This option is not available in Harmony Stand Alone, as render jobs are sent to a Harmony Server database, and machines that perform the render must be connected to this database. Local Rendering is done directly by your machine in your Harmony session. Hence, it uses your machine's resources and will prevent you from working on the scene until the render is done. You will see the render progress in real time and will be able to preview the results right after it's finished. Batch Rendering is done by sending a scene to the server's render queue so it can be processed by the render farm. This allows you to keep working on your scene while the render is being done. The rendering progress can be monitored in Control Center and, when finished, the results can be previewed in Harmony Play. Batch Rendering gives you access to additional rendering options. When sending a scene to batch rendering, it is not rendered immediately. Computers connected to the Harmony database that are configured to render scenes for the database check for new render jobs periodically, and start performing the render job when they find one that isn't already being rendered by another machine. NOTETo configure a Harmony Server database and to set up clients to perform batch rendering jobs, see About Batch Processing. From the top menu, select File > Export > Render Write Nodes or press Ctrl + Shift + Y (Windows/Linux) or ⌘ + Shift + Y (macOS). The Export Images dialog box opens. In the File Type list, select the desired file type for the exported images. In the Colour Mode list, select an option to export your images: Colour, Colour with Transparency, or Greyscale. 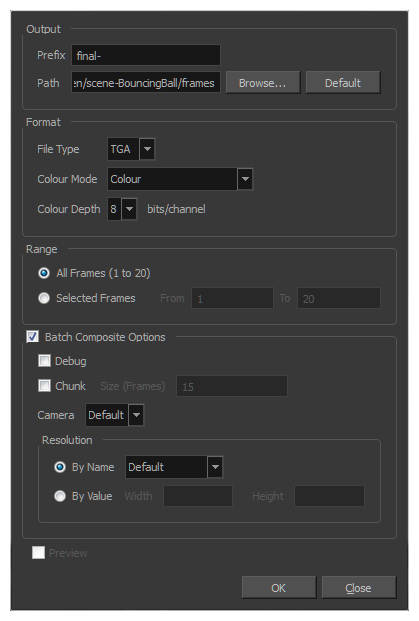 In the Colour Depth menu, select the number of bits per channel for the exported images. Most format only support 8 bits, but some support 16 bits. If you want to render all the frames in your scene, select All Frames. If you want to render a specific sequence of frames, select Selected Frames then, in the fields to the right, enter the number of the first and last frame of the frame sequence you wish to render. Enable Batch Composite Options. This will send your scene to your Harmony database's batch rendering farm, whereas disabling this option will make Harmony render your scene locally. NOTEWhen Batch Composite Options is enabled, the Preview option is not available. This is because Harmony does not track the progress of a render when it is performed by the Harmony database's render farm. You can only enable the Preview option when rendering locally. If you want the machine that will render your scene to output detailed information about the process in its log, enable the Debug option. If you want to split the render job for your scene into several smaller render jobs, so that the load can be shared by different machines in the render farm, enable the Chunk option. Then, enter the amount of frames each chunk should render in the Size (Frames) field. If you want to render the scene from a specific camera, select the desired camera from the Camera drop down list. A scene can have several cameras added in the Timeline view, and each of them can be animated independently. If you want to render the scene in its actual resolution, select By Name and, in the resolution preset drop down list, select Default. If you want to render the scene in one of the available preset resolutions, select By Name and, in the resolution preset drop down list, select the desired resolution preset. If you want to render the scene in a specific resolution, select By Value, then enter the Width and Height of the desired resolution, in pixels. Click OK to start the rendering process. If the selected frames were already sent to the Render queue, but were not yet rendered, dialog box opens to inform you that these frames were already in the queue, but that they have been updated with the selected options. You can also send scenes to batch rendering and check the status of the rendering queue using the Control Center application.